The original DFC9500's composition and design have been carefully studied by the Canadian Plastic's Institute and all of their recommendations have been implemented in the design of DFC9500. Our use of the high quality "Engineering Grade" plastics, and design modifications, recommended by the Institute have made the DFC9500 extremely durable and strong. 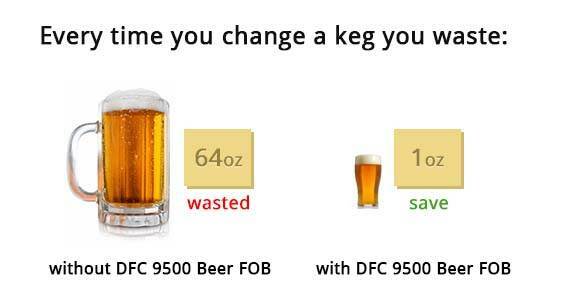 Although we don't recommend it, the DFC9500 is strong enough to lift a full keg off of the ground. Easy to operate. After changing keg's beer flow can be restored with the twist of the wrist. Simple installation takes less than five minutes. The DFC9500's non intrusive design allows it to be installed without having to make changes to the existing system (cutting into supply lines, new fittings etc.). Installation can be done directly on the keg connector. 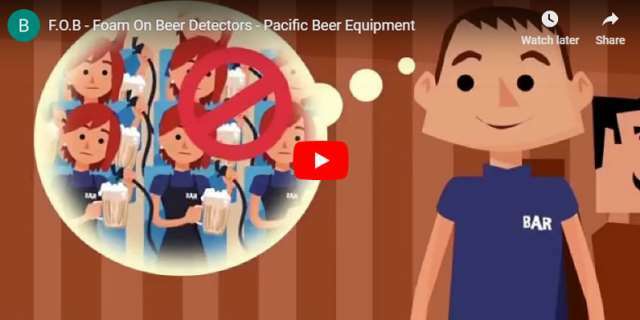 The DFC9500 stops beer flow instantly when a keg empties, keeping the supply line full of beer. Beer is no longer wasted as foam when a new keg is tapped. Save an average of one pitcher of draught per keg. Much greater savings is seen at installations with longer than average supply lines like Stadiums, Airports, and Hotels. 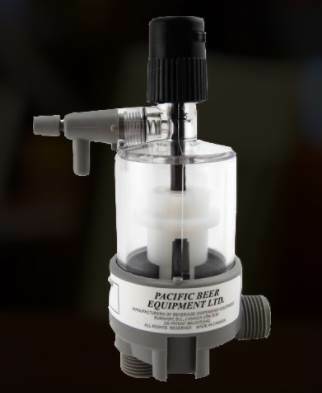 Reduces the amount of CO2 or Beer Gas used because it no longer fills the supply line and escapes out of the tap. Ideal for installations with computer portion control, and flow metering systems, which can lose Calibration and give inaccurate total volume readings when gas passes through them. Bartenders require less time to change kegs because the supply lines do not need to be cleared of gas and foam to get to "clear" beer. Servers do not have to wait to have their orders filled. Keeping the supply lines constantly full of beer reduces the amount of contaminants i.e. beerscale, and sludge, which forms in lines faster when exposed to air. As a result supply lines remain cleaner and beer tastes fresher between cleanings. The DFC9500 has a low interior volume and injector tubes that maintain agitation throughout the chamber. This inhibits the buildup of deposits inside the unit. Manual hand cleaning is easy because the DFC9500 can be completely taken apart and put back together in a few minutes. This design also makes servicing the units, if necessary, quick and easy. F10/M10 G5/8'' female inlet and a G5/8'' male outlet. This base is known as a "Keg Mount Base"
F8/M8 1/2 ''female inlet and a 1/2 ''male outlet. This base was designed to be used on MicroMatic tapping heads. This base is also known as a "Keg Mount Base"
M10/M10 G5/8 ''Male inlet and outlet. This base is known as a "Wall Mount Base"
FJG6/ FJG6 3/8'' John Guest SpeedFit on the inlet and the outlet. This base accepts 3/8 ''O.D. tubing. This base is also a "Wall Mount Base"
F8/FJG6 1/2'' female inlet with 3/8'' John Guest SpeedFit on the outlet. This base is also called a "Keg Mount Base." F10/FJG6 G5/8'' female inlet with 3/8'' John Guest SpeedFit on the outlet. This base is also called a "Keg Mount Base."